Alberta's premier responds to questions from Canadians about what's being done to help the struggling oil and gas sector, from the national debate over pipelines, to the production and transportation of oil, to climate change and carbon taxes. Alberta's oil sector is under intense pressure from an economic downturn, cuts to production and uncertainty around the Trans Mountain pipeline expansion project, leaving many deeply concerned about the future of the province and its energy-based economy. 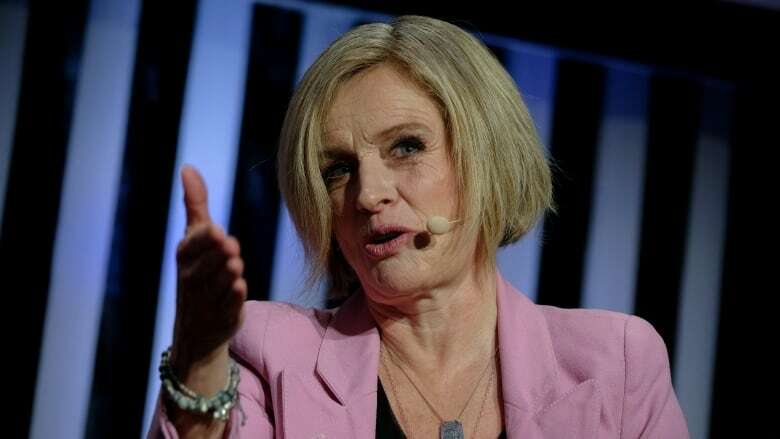 The National co-host Rosemary Barton travelled to Edmonton this week to host a town hall where Premier Rachel Notley answered questions from Canadians about the difficult issues facing Alberta. Topics included the national debate over pipelines, the production and transportation of oil, climate change, and carbon taxes. Chris Slubicki, president and CEO of Modern Resources Inc.
And Barton spoke with Jason Kenney, leader of the United Conservative Party of Alberta, in a wide-ranging interview about the challenges facing Alberta that aired on The National this week. Lola Strand was born in Drayton Valley, Alta., and says she saw the need to bring the community together for a monthly dinner. It started out with 70 people and two years later has expanded to a regular gathering of 300. It's a chance for the townspeople to discuss the state of the industry, and for those hurt by the downturn to get a good meal. Local businesses prepare and staff the dinner as a way of giving back to the community, and donations help ensure there is enough food to go around. "What we have noticed over the last specifically couple of years is that the folks that are coming in looking for resources are those people who never imagined that they would be in the position to be looking for support that way," Strand says. "They are the folks that are losing their jobs due to the downturn in the economy." Strand, who works with Drayton Valley Family and Community Support Services, says that despite the fact that many of these people have planned for the boom and bust cycles that can be expected in the oil and gas industry, it's "just going on too long this time." "Their savings are depleted, they're starting to use credit, and that's starting to run out as well," she said. "Unfortunately, lots of people are saying right now that they may have no actual choice but to actually move away from this community, and possibly move away from Alberta. Which is really sad, because for many of these people this is their home and they've been here all their life." Chad Miller, a pipeline facilities consultant who works in the oil and gas industry, says the drop in the price of oil started affecting his ability to get business in September 2015. "There was not a lot of talk and I couldn't find work anywhere," he says. As the months went on, Miller said he started to help others struggling to find employment opportunities in the industry. Miller founded social media networking website Oilfield Dads in late 2015, which provides assistance to the community of oil field workers in Alberta. "I built this group for those in need of support to find jobs, share stories and overcome hardships, in a way of solidarity for the oil and gas industry," he said. ​"You get depressed, and this group was a forum to see that they were not alone and they weren't the only ones going through this." Miller says he feels betrayed by Ottawa and wants Alberta to "cater no more to the false promises of the federal government." Gary Nelson has worked in Drayton Valley, Alta., for ​42 years and says the current economic downturn facing the province is the worst he's ever seen. Nelson says business has dwindled tremendously and his family-run company, Nelson Brothers Oilfield Services Ltd., is making little profit and struggling to keep staff employed. "My brothers and sister got into the business in 1976. I've got four boys and they work for themselves through Nelson Brothers," he says. "The economy has not been kind to us." Nelson wonders why Canada imports oil products from other countries, as opposed to building a pipeline to transport its own energy products. ​"Why can't we get a pipeline?" he asked. "It's the cleanest way of moving oil. If somebody's worried about the environment, go through a pipeline." Nelson blames the lack of business on the drop in the price of oil, and Alberta's "landlocked" resources that can't be easily transported to buyers. "Canada's got to get together, rather than work apart," he says. "I mean, why would we buy oil from Saudi Arabia when we've got tons of it here?" Fred Kerr, former vice-president of investor relations at Pengrowth Energy, was laid off in 2014 when the price of oil started to drop. The 54-year-old has been looking for work for the past three years, but isn't optimistic about his prospects in the oil-and-gas sector and is currently unemployed, but performs as a stand-up comedian in his spare time. "Before I started doing comedy, I was an institutional stockbroker. My job was to advise international fund managers on their investments in Alberta companies," he says. "I think Albertans and investors alike expect governments to understand that what drives the economy and drives employment is private-sector investment. "Unfortunately, some of the things the government's done the last few years have put investors off to the point where a lot of my former clients won't touch Alberta now."